We were fist introduced to Vincent when our very own Podcast King produced the Thrillercast series in 2008 commemorating the 25th anniversary of the greatest selling album of all time. Vincent contributed one of the most compelling episodes when he described his experience dancing and working with the musical genius. 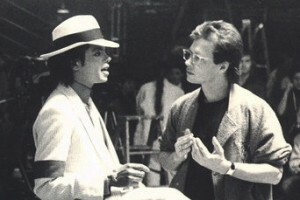 Although Vincent’s early work with MJ was notable, one of his greatest contributions to the legend of MJ came in 1987 when he collaborated and choreographed the epic music video Smooth Criminal. We recently spoke to Vincent and he gave us a behind the scenes view of the making of this memorable video. And if you’ve tried any of these moves yourself in the Michael Jackson Wii game, then you know it’s not nearly as easy as they make it look, especially when it comes to that gravity defying lean that no one has been able to figure out. You’ll have to read on to see if Vincent talks. How did Jackson approach you to choreograph this piece and did he have an idea for the storyline and dance? I had danced with MJ in two videos. I was the gang leader in Beat It, and a zombie dancer in Thriller, as well as being the assistant choreographer for Michael Peters. I was at home one night and got a phone call. A very soft voice asked for Vincent Paterson. I thought it was someone playing a joke on me, using a voice like Michael Jackson. “Who’s calling? “ I asked. “It’s Michael Jackson,” was the reply. “Who the hell is this?” I asked. Same response. “I’m gonna hang the f*** phone up if you don’t tell me who is calling,“ I said. It really was Michael Jackson. I profusely apologized. MJ was working on his latest CD at a recording studio in Hollywood and asked if I could stop by. I rushed over hoping he wanted to ask me to dance in another video. We went into the studio and he played the music to “Smooth Criminal” for me, and asked me what I thought. I loved it. He then asked me if I could come up with an idea for the video and would I choreograph and direct it. I was floored and honored and excited beyond belief. Can you tell us about your process in putting this movement together. I knew Michael liked the movies of Fred Astaire, so I researched movement from Astaire’s musicals, usually choreographed by Hermes Pan. Michael was in the recording studio during much of my initial creative process with the dancers. He gave me a soundstage on which he had had a wooden floor constructed for the safety of the dancers. The bottom floor of the set that we had discussed was on the soundstage. He also gave me an incredible sound system, a video camera and 10 dancers with whom to begin choreography. Every morning, we would have a dance class, then I would begin to choreograph movement on the dance floor and then move the dancers into the set. At the end of the day I would video what I had done. I would go to Michael’s house and we would watch the work. MJ usually said, “That is really great. I think you need 10 more dancers.” I would hire more dancers and the daily routine would begin again. This happened until I had a second floor built on the set and had hired about 50 or so dancers to be in the video. How long did it actually take you to create, rehearse and shoot this piece? I don’t remember exactly how long the process went on, but I would say for about a month or 6 weeks. 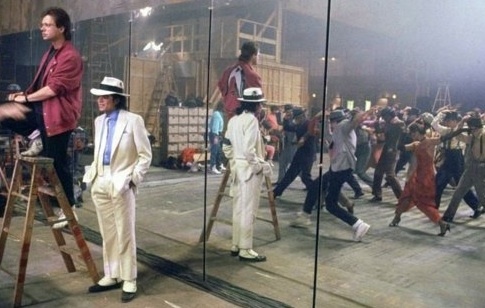 What began as a music video became part of the film, Moonwalker. I worked with Michael to extend the song and it became a 10 minute piece in the movie. After creating the piece, I worked with MJ alone. His rehearsal technique was mind-boggling. I would teach him a section I had choreographed, he would play with some of the rhythms and we would adjust the movement. Then Michael would stand in front of a mirror and perform one section of dance over and over and over until it was not only perfect, but also looked as if he was improvising the work at that moment. He had ceaseless energy and focus. How was Jackson to work with in the collaborative process? I adored Michael as an artist and as a collaborator. He trusted me. I would create the movement for him and the dancers—every dancer is moving on every beat throughout this entire song. I would leave space for MJ to create his own movement and do his thing. He worked hard to come up with his own specific way of moving and I wanted to always afford him the opportunity to highlight his dancing. In all the years I worked with Mike–over 16 years, I never heard him say anything cruel or unkind to anyone. In the collaborative process he would always say to someone, “This is very good, but I was thinking we could try something a little more like this…” Whether this was about costumes, sets, lights, whatever. He was a unique and brilliant man and he will always be missed. He was gone too soon. Is there a sequence of movement that you are most proud in this work? Everyone asks about the leaning dancers. Everyone wants to know how we did it. I won’t tell. However, it had nothing to do with shoes being nailed to the floor. Ha!